Indian Fry Bread batter is a four ingredient (non yeast) bread that fries up crunchy and crispy on the outside while light, tasty, and tender on the inside. It is so easy to whip up! Sprinkle with brown sugar and cinnamon straight out of the fryer, better yet dust with powdered sugar or my absolute favorite top with taco meat and fixings for Navajo Tacos. Do you like tacos? We absolutely love them around here. 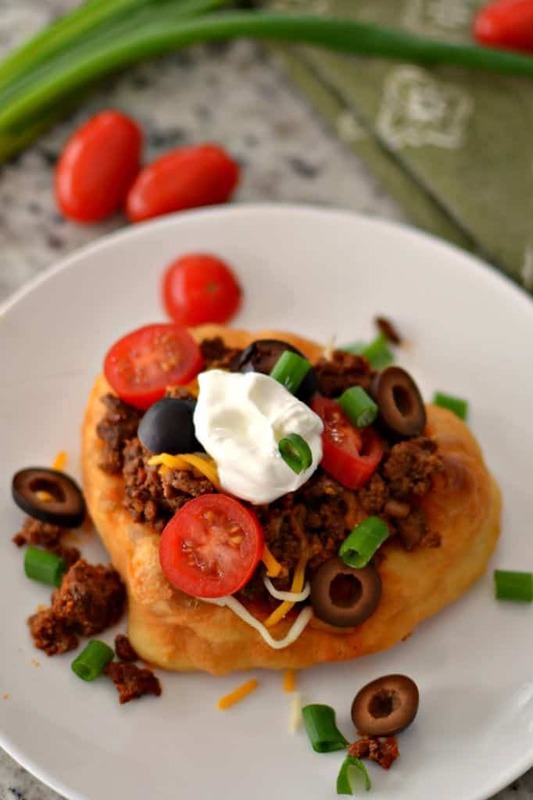 As my daughter says “I have never meet a taco that I did not love.” We also love Indian Fry Bread. I mean honestly who wouldn’t adore a piece of slight puffy bread that is crispy and crunchy on the outside and tender and airy on the inside. Now combine the best of both worlds. 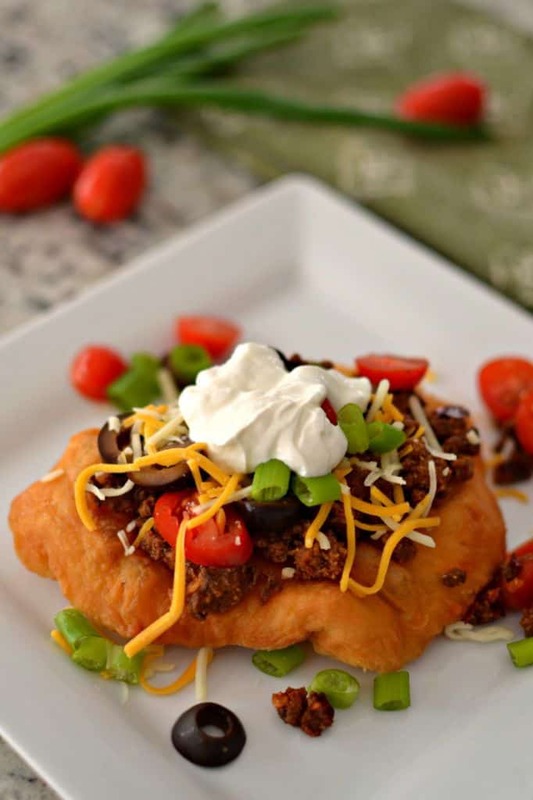 Top that fry bread with taco seasoned ground beef, shredded cheese, tomatoes, black olives, scallions and sour cream and you have a match made in heaven. Indian Fry Bread is best while still warm however I have reheated it in the microwave for my hard working husband with pretty darn good results. Just about fifteen seconds is all it needs. Then top with all the rest of the goodies and enjoy! 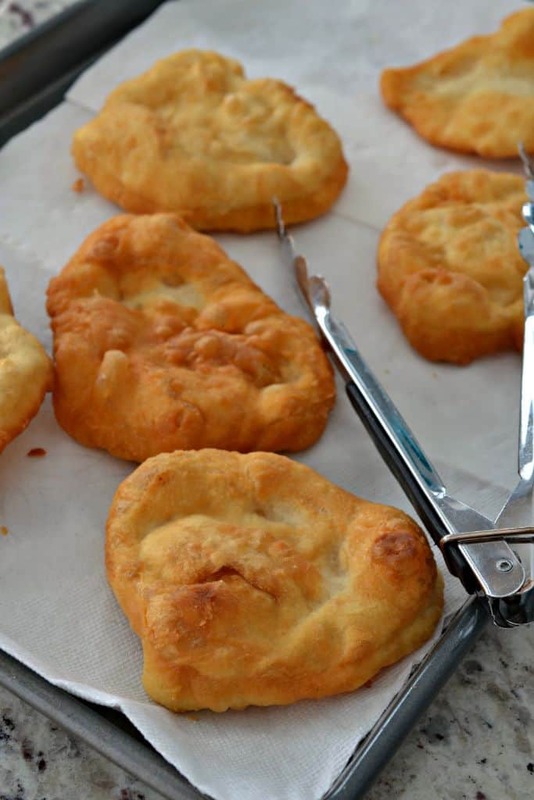 How do you make Indian Fry Bread? In medium bowl whisk flour, baking powder and salt. Slowly stir in warm water with a fork and mix until dough comes together. Cover with wrap and let rest at least 1 – 2 hours. This is a sticky dough so you will need to flour your hands and the working surface. Pull off a piece a little smaller than a golf ball. Roll into a ball as best you can, then pat it out like a mini pizza. You can also roll them out. They should be a little more than 1/8 to 1/4 inch thick. Don’t worry if they are not all round or the exact same size. In a heavy pan heat 1-2 inches of oil to 375 degrees. Fry until the bread is golden brown and puffs up. Then turn and fry the other side until golden brown. Roll and fry as you go that way if you want them thinner or thicker you can adjust accordingly. Remove to paper towels to drain and cool enough to handle. How do you make Navajo Tacos? While you are the making the Indian Fry Bread brown some ground beef. Add the taco seasoning and water. Simmer for five to ten minutes. Spoon the taco meat on to the warm bread. Top with shredded cheese, tomatoes, green onions, black olives and sour cream. Serve as soon as possible while everything is tasty and warm. 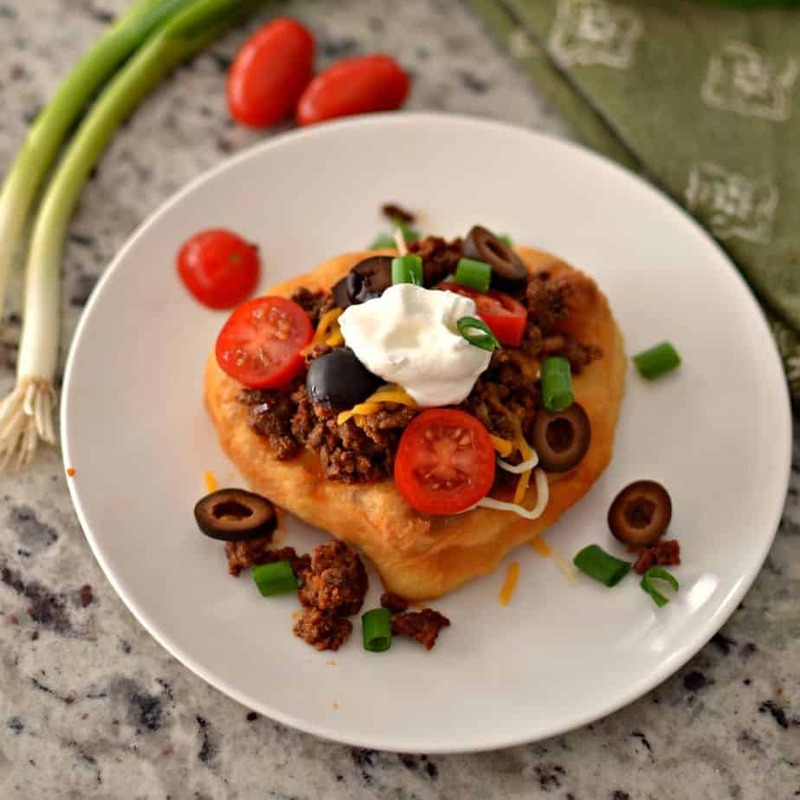 What other recipes you can make with Indian Fry Bread Recipe? As soon the fry bread comes out of the fryer dust with powdered sugar and serve with fresh maple syrup. When warm top with a mixture of brown sugar and cinnamon. They are just as delicious as a bakery doughnut. Take your peanut butter and jelly sandwich to all new high. Just be sure to add the peanut butter first because it makes it easier to spread peanut butter on warm fry bread. Pile on chicken or steak fajitas for an original taste and filling meal. Add just enough water for the dough to pull together which is usually 1 cup however flour contains moisture so it may be a tiny bit less. Stir just until the dough ingredients are combined. Over mixing can make the fry bread tough. Cover and let rest for at least one hour. Flour your hands and the working surface. Roll the dough in balls and then pat out to 1/8 to 1/4 inch thick. Fry one or two to begin with so you have time to adjust the thickness if desired. 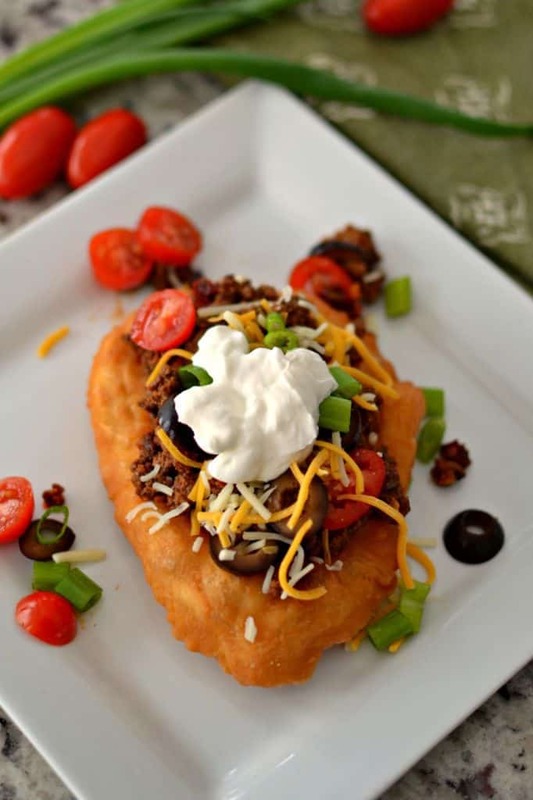 This super easy Indian Fry Bread is scrumptious, simple and easy on the pocket book. Fry up a batch this morning and sprinkle with cinnamon and brown sugar while still warm. So delicious! Not a huge sweet breakfast fan? 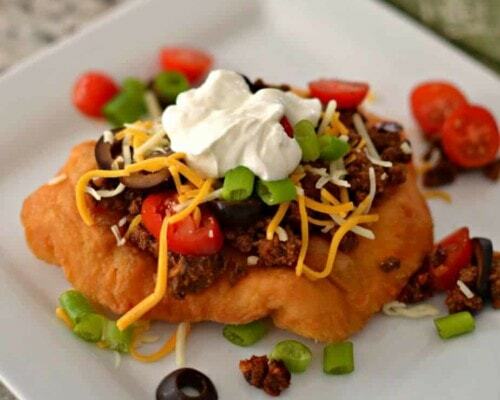 Well then make a batch of fry bread this evening and cook up some super flavorful Navajo Tacos! It is at the bottom of the post. Just scroll down and read full directions. Hello this sound very good and easy, almost like flour tortillas recipe,I’ll try this for sure,I am also going to try for the keto people using almond flour,lets see how well it does. what do you think? I have never tried almond flour! Let me know who they turn out! !